October is Relationship Violence Awareness Month, and the campus community is encouraged to participate in a series of public events aimed at creating awareness, education and dialogue. Beginning this week, members of the Emory community can learn more about sexual violence prevention strategies and show support for survivors of sexual and relationship violence through a public art installation, a community forum and several hands-on training opportunities. “Programs like this are not just important, they are essential,” says Wanda Swan, associate director of advocacy for Emory’s Respect Program, a central hub for sexual and relationship violence prevention programs and survivor support. “We have to understand the importance of creating safe spaces on campus, creating a community that’s educated and aware and knowledgeable of not only the perpetration and occurrence of violence, but also that we all have roles we can take to end violence,” she explains. New to the awareness month this year: The event is being coordinated by a broad-based campus coalition representing more than a dozen organizations. Another big change will involve the traditional Take Back the Night Rally, which will include voices of not only survivors of violence but also, for the first time, stories of bystander intervention. 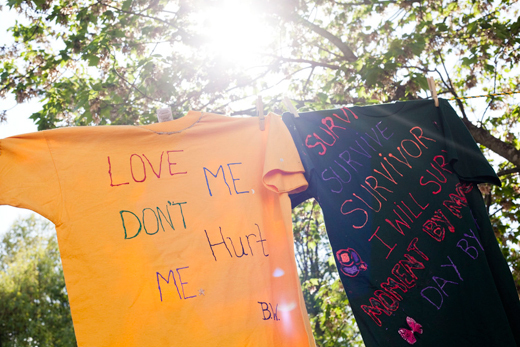 T-shirts bearing graphic messages and illustrations denouncing relationship violence — designed by those directly or indirectly impacted by violence — will be incorporated into a public art installation that will be on display through Monday, Oct. 26, at the DUC Terrace. The worldwide campaign strives to increase awareness of the impact of violence, to celebrate the strength of survivors, and to provide an avenue for survivors to break the silence that often surrounds their experience. T-shirt submissions may be dropped off through Monday morning at the Center for Women at Emory. This annual event invites faculty, staff and students to gather as a community to share stories of survivors at Emory and to demonstrate support for those who have been impacted by sexual and relationship violence. Speakers will read stories submitted anonymously by survivors of sexual and relationship violence and stories of bystander intervention. Survivor or active bystander stories may be submitted anonymously at bitly.com/emorytbtn2015. Immediately following the gathering, an informal community coffeehouse will be provided for reflection and fellowship in the Winship Ballroom. Coffee, cider and sweets will be provided by Emory Dining. Learn about the myths and facts surrounding sexual assault, sexual misconduct policies, basics on survivor care and response, and more about resources in the greater Atlanta area in this two-hour training session. Developed by and for Emory students, the SAPA program aspires to create a supportive campus for sexual assault survivors in which peers are supportive of others when they disclose an assault. The SAPA 101 training is the first step toward becoming a SAPA advocate. For more information, visit here. Learn what a bystander can do to effectively assess a situation and intervene to prevent sexual or relationship violence in a training program developed by Drew Rizzo, health promotion specialist for the Respect Program. The Center for Women at Emory (CWE) presents “Dating Violence at the Intersection of Race, Gender and Sexuality,” an interactive workshop conducted by Ulester Douglass and Lee Giordano, who are the executive director and director of training respectively for the national organization Men Stopping Violence. This year’s Relationship Violence Awareness Month planning committee includes representatives from the following organizations: The Alliance for Sexual Assault Prevention (ASAP); Center for Women at Emory (CWE); Communications & Public Affairs; Counseling and Psychological Services (CAPS); Emory Athletics; Emory Dining; Emory Human Resources; Faculty/Staff Assistance Program; Office of Sorority and Fraternity Life (OSFL); The Respect Program; Sexual Assault Peer Advocates (SAPA); Intimate Partner Violence Working Group (iPVWG); Office of Institutional Equity and Inclusion; and Peace and Love. For more details or information about how to volunteer throughout the week contact Swan at wanda.swan@emory.edu.